Reasons for concern: This plant grows in landscapes, gardens, and turf, and detracts from their aesthetic value. It can also serve as a reservoir for a number of plant viruses, including alfalfa mosaic virus, tomato yellow leaf curl, and tomato spotted wilt. It grows close to the soil, preventing desirable native plants from growing, and reducing the plant biodiversity that is so important to pollinators and wildlife. Botanical description: Rounded and bushy herbaceous plant. Leaves: Seedlings have cotyledons with heart-shaped leaves with smooth edges. 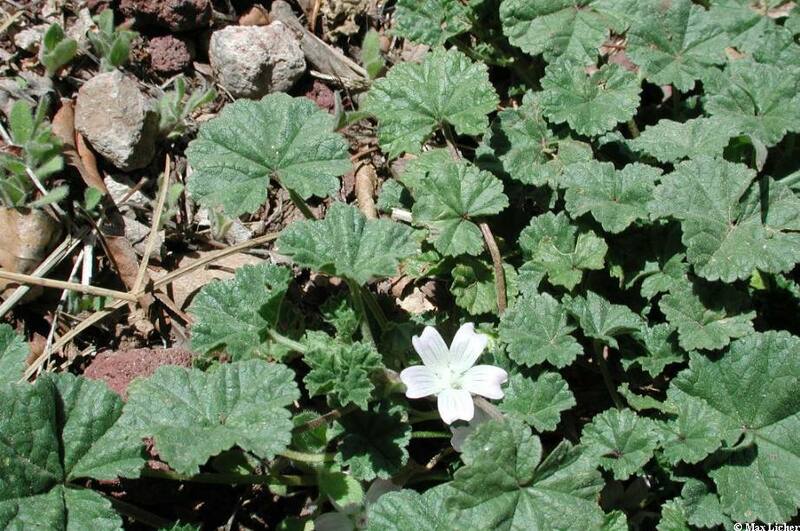 First true leaves are geranium-like, hairy, on a long stem, and nearly circular to heart-shaped with 5-7 rounded lobes with crinkly edges. Short hairs appear on leaf surfaces. Stem(s): Tough, spreading and low growing. Occasionally upright. 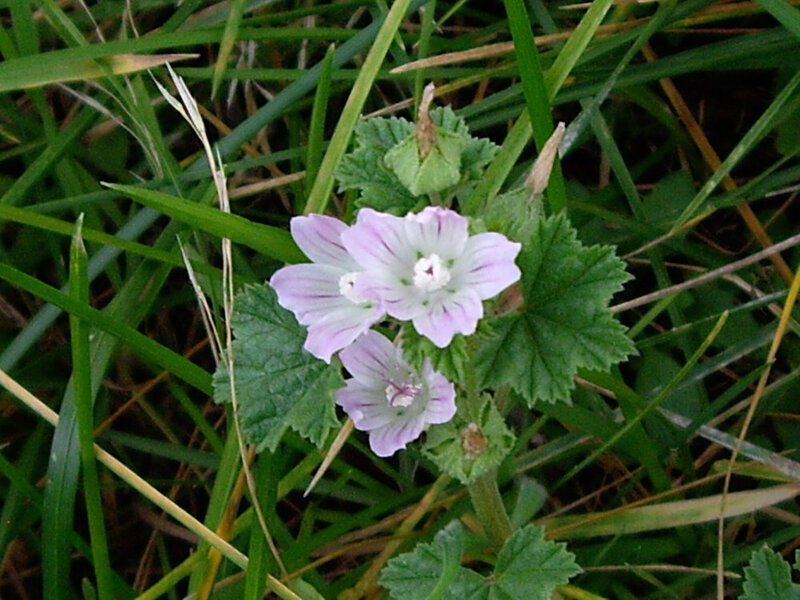 Flowers: White to light pink, which form at ends of stems. Five notched petals with pale striations. Blooms summer through fall. Seeds: Contained in round fruit which looks like tiny wheel of green cheese with wedge-shaped sections. Roots: Large, tough taproot, which gets woody as plant matures. Where it grows: Lawns, gardens, roadsides, pastures and disturbed areas. Grows in sun or shade. Found at elevations from 4,000 to 8,000 feet. Weedy characteristics: Seeds remain viable in soil for a long time. Deep, stout taproot makes them hard to pull or dig. Dense populations starve nearby plants of sunlight. Look-alike native plants: Can be confused with native globemallows (Sphaeralcea spp.). Globemallow species in northern Arizona usually have orange flowers but some species in the state have pink or white flowers. These often have more triangular leaves. Globemallow flowers do not have striations on petals. Stems are taller and more upright. 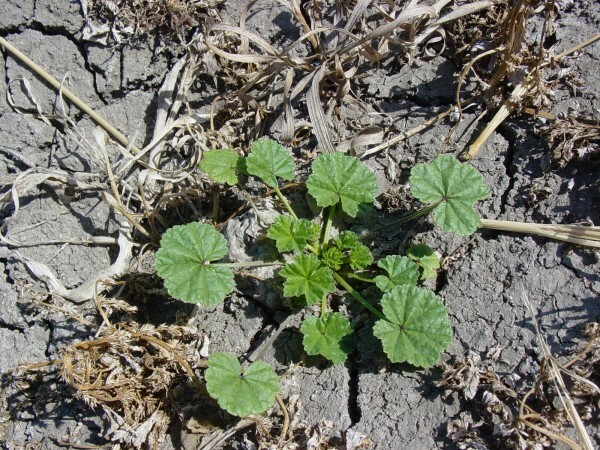 Control strategies: Common mallow is best controlled when small. Pull, hoe or dig when plants are young since the taproot is not as large, deep or tough. Consider covering a dense population with a very thick mulch. This will also prevent seed germination. Without sun, plants will eventually die. Frequently monitor previous infestations for new growth. Plant desirable native species to out-compete invasives. Some broadleaf herbicides are effective on young plants and pre-emergence herbicides can be used to control seed germination. Glyphosate is usually not effective. Contact your local county extension office for more information on chemical control.